Nine of the most famous essays by one of the preeminent philosophers and art historians of the pre-modern world, east and west, exploring such subjects as the true function of aesthetics in art, the importance of symbolism, the role of traditional culture in enriching art, the nature of medieval art and more. I. WHY EXHIBIT WORKS OF ART? II. 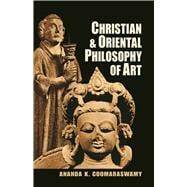 "THE CHRISTIAN AND ORIENTAL, OR TRUE, PHILOSOPHY OF ART"
III. "IS ART A SUPERSTITION, OR A WAY OF LIFE?" IV. "WHAT IS THE USE OF ART, ANYWAY?" VIII. "THE NATURE OF "FOLKLORE" AND "POPULAR ART"